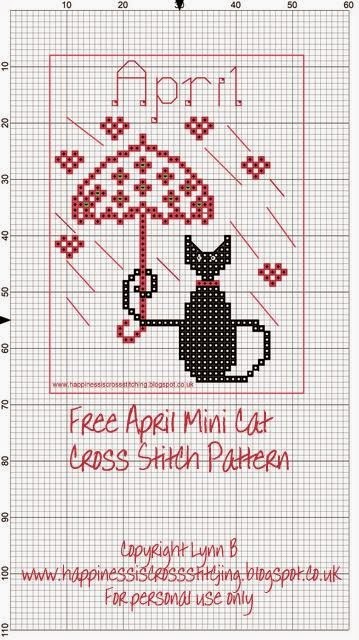 Hi everyone, here is the mini cat design for April. I do hope you like it! I have a nasty habit lately of not clipping my threads at the back and as you can see they show through, much worse if it is black thread behind white fabric! Ughhh!! Don't forget to stitch the whiskers, I forgot to put them on the pattern! Here is the April mini cat design, just right click and "save as" to your computer. Loving your monthly cats. I just finished 'January' yesterday so I am all ready for 'April'. PS. You are not alone in not clipping the threads. I keep doing it myself. So nice the cat are, I like them. I just finished a project where I used dark gray thread on white aida. Had to go back and clip and used a glue stick to keep the threads down. Tus acericos son preciosos ,me encanta !!! Lynn, April mini cat is adorable!!! Lovely as usual! Your work always brings a smile to my face. Oh my - another adorable design. You keep outdoing yourself!!! So cute, Lynn!! I love how this one is "raining" hearts :) Thank you again for this adorable series! Adorable, I have enjoyed making January,February designs. Yet to do March. Thank you so much Lynn, it is such a pleasure to come to your blog and read of all your wonderful stitchery and craft.Shirley N.Z. Il est adorable avec son parapluie !! Merci de partager votre créativité avec nous ! This is so cute!! Thank you for the pattern. Que bonito!!! !, me encanta, me pareció muy buena idea la de hacer todos los meses. Lynn: April Cat is so sweet, thank-you for another beauty. Thank you for the adorable monthlies. May mini cat pattern now ready!